Paringa is 216km north-east of Adelaide and only 5km from Renmark. The road south-east from Renmark is on the eastern edge of the Riverland and the gateway to Victoria including the towns of Wentworth, Merbein and Mildura. You can also enter South Australia from Sydney and Canberra and the Riverina via Paringa. Paringa is from an Aboriginal word meaning "big bend in the river". In 1913 Paringa became the first Murray town to become connected to Adelaide by rail. The Paringa Suspension Bridge was opened in 1927 and is only one of five spanning the Murray River in South Australia. Twice a day the lifting span bridge (officially opened in 1927) rises to let river traffic pass beneath - quite a sight. From Paringa take Murtho Road on a short journey where you will end up at Old Customs House, a historic port, with a great bush wetland walk. Here you will find numerous facilities, including a kiosk, barbecue, camping sites and Customs House Houseboats (formery Alura Houseboats). For further information on the walk refer to the Riverland Nature Trails brochure or call into the Old Customs House building. Off the Lock 5 Road, is a popular bushland area fronting the Murray River. Nearby Lock 5 is an example of the river control systems built in the 1920's and 30's. Picnic facilities are available. A lookout at Heading's Cliffs You can admire the marvellous river view and rest at the camping area developed in the Murtho Forest Reserve. Another popular Paringa attraction is the antique and collectables store that houses the region's biggest collection of paraphernalia and other "-alias", including kitchenalia and garagenalia. A selection of accommodation is available in Paringa and its surrounds, including motel, caravan park, cottages, houseboats and camping sites. Bert Dix Memorial Park - BBQs, toilets, boat ramp and picnic area. Mildura offers the closest railway station along with scheduled services from the Renmark Airport. 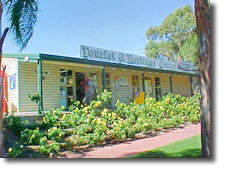 Renmark also have the nearest coach terminal. Income is mainly derived from sheep stations, agriculture, viticulture and horticulture, producing revenue from both fresh and dried fruits.